Schoolboy Cricketer of the Year 2003 with the trophies. CRICKET: The 23-year-old Sri Lanka allrounder Mohamed Farveez Maharoof who is presently playing for Delhi Dare Devils team in the Indian Premier League cricket tournament was the winner of the Observer, Schoolboy Cricketer of the Year Award in 2003. 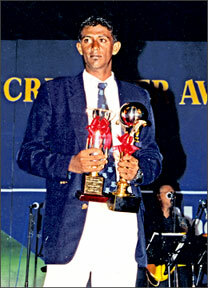 Former wesleyite Maharoof, won the Schoolboy Cricketer of the Year Award 2003 and was also picked as the Best Batsman All-Island and also figured prominently in the final round of the Best Bowler, Best Allrounder and Best Captain awards. He was picked for the top award in school cricket by the panel of umpires from three associations - Association of Cricket Umpires and Scorers, Sri Lanka, Central Province Cricket Umpires Association and Southern Province Cricket Umpires Association. Maharoof showed early promise as a cricketer and he had many fine knocks with the bat and claimed many wickets with his bowling in inter-school cricket matches. The climb to the top in inter-school cricket was sharp and it was no surprise that the judges in the Observer Schoolboy Cricketer of the Year Contest picked him for the top honour. Farveez Maharoof born on 7th September 1984, is a right-hand bat and right-arm fast medium bowler. He played for Wesley College from the young age of 11 years at junior level under-13, under-17 and the first XI with distinction. Maharoof, the 1st eleven captain of Wesley in 2001 and 2002, established a fine record of scoring a double century (243 not out) against Richmond in 2002 at the Galle International Cricket Stadium. None of the past Wesley cricketers have achieved this feat. He has represented Sri Lanka Schools under-19 side against the visiting England Academy side in 2003 and slammed a quick-fire century (100) off 99 balls. He was also in the Development Cricket Squad run by the BCCSL. He had the distinction of playing for the BCCSL Board XI led by Romesh Kaluwitharana against the New Zealanders in 2003 and scored 22 runs and he claimed the wickets of Kiwi skipper Stephen Fleming and Scot Styris. Maharoof had a good run in England, playing for Stanmore in the Middlesex County League. He figured prominently with the bat and ball, scoring heavily and capturing wickets. He has been a great asset to Stanmore who became Ladbrokes Middlesex County League Champions for the second time. For his excellent performances for Stanmore, the Australian coach of Middlesex invited Maharoof to play for the Middlesex 2nd XI. In the 2003 inter-school cricket season, he scored 845 runs which included two centuries against Ananda (146) and Nalanda (106 not out) and five half centuries. He has also bagged 42 wickets with 5 for 56 against Ananda as his best effort. He also played a few games for CCC in the under 23 tournament. At Wesley, he was also bright in studies an ‘A’ Level student. His father Hassan Mohamed who was also a good sportsman during his younger days representing the CMC Community Centre and Playgrounds. So, young Maharoof got all the support from his father. He started club cricket in a big way, turning out for Bloomfield and proved his allround capabilities in most of the Premier League matches. Maharoof is a promising new allrounder in the Sri Lanka team. He first made his impression in the under-19 World Cup in Bangladesh where he captained the Sri Lanka team. He enjoyed a prolific school career for Wesley College with a highest score of 243 and best bowling figures of 8 for 20. Maharoof has a sound batting technique and is able to adopt to different conditions. He is wellknown as a player who can score runs down the order but he is also capable of playing patiently when in tight situations. Maharoof’s Test match bowling figures (24 wickets at an average of 60.75) do not show his natural talent as sometimes he is underbowled. This was amply seen in the third Test between England and Sri Lanka in 2006 when he did not bowl in the entire match. In the qualifying round of the 2006 International Cricket Council Champions Trophy, Maharoof had the best bowling figures in the history of the tournament - 6 wickets for 14 runs which is also the 9th best analysis in all one-day international matches. That was against the defending champions West Indies and it was Maharoof’s first five-wicket haul in ODI’s. Maharoof took 4 for 23 against Bermuda to start the 2007 World Cup and became the first Sri Lankan to take a 4 wicket haul on his World Cup debut. He also took his 100th wicket in his 75th one-day International, becoming the fastest Sri Lankan to reach that landmark, beating Muttiah Muralitharan by one match. Farveez Maharoof, the Sri Lankan allrounder was ruled out of the West Indies tour recently with a side strain. He suffered the injury during the recently concluded CB Series in Australia, but was named in the 15-member Test squad for the two matches against West Indies. Selection Committee sources stated that Maharoof had failed to recover sufficiently from the injury and had to miss the tour. Left-arm fast bowler Chanaka Welegedera who toured Australia for the CB Series but did not play a single match due to a technical problem with his follow through, where he was warned for running on the pitch, was the replacement for Maharoof for West Indies tour. Maharoof recovered from the side strain and presently is in India representing Dare Devils, Indian Premier League team of New Delhi. Altogether Maharoof has played in 20 Tests, scoring 538 runs, batting average 19.92. He had three half-centuries and top score of 72. He took 24 wickets after bowling 2,628 balls, best bowling - 4 for 52 and he has taken 6 catches. He played 75 one-day internationals and scored 751 runs at an average of 19.96. He has two half-centuries, highest unbeaten 69. In bowling, took 100 wickets, sending down 3,075 balls, average of 23.88, best bowling figures 6 for 14 and held 16 catches. At a recent meeting, Maharoof said that the Observer Schoolboy Cricketer of the Year Contest gave him all the encouragement to forge ahead in the cricket world. Schoolboy cricketers he said should be encouraged a lot and the results will follow.